Dora the Explorer Is a Weapon-Toting Teen? Not long after learning Michael Bay was on lock to produce a live action Dora the Explorer movie, Jezebel suggested the film take note from prestige drama and get gritty. Well, here we are. 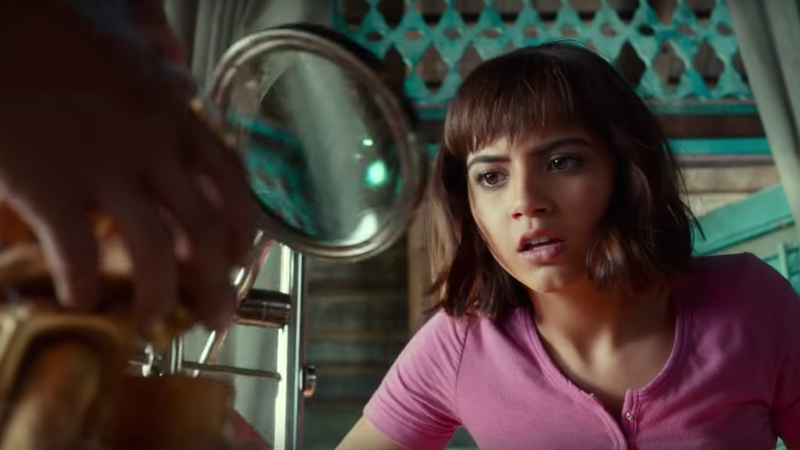 For all its apparent darkness, there seems to be a pretty linear narrative to high school Dora, who’s played by Isabela Moner and with the enthusiasm of someone much younger. In this version, Dora lives in the jungle—apparently with a non-speaking backpack (missed opportunity)—along with her explorer mother Eva Longoria and her hot father Michael Peña, as well as a CGI monkey named Boots, voiced by Danny Trejo. Her parents are on their way to uncovering the lost city of gold, which they anticipate to be very dangerous, so they send Dora to live with her cousin Diego in some major city I’m going to assume is Los Angeles. While adjusting to life as a normal teenager, Dora goes on a field trip and gets kidnapped by a deep-voiced bad guy who expects Dora, a child, to lead him to her parents and the aforementioned gold place. It seems stressful, and Dora has a lot of weapons and survival supplies on her person at all times, something I do not recall seeing on Nick Jr. But I imagine they’ll come out alive. Dora and the Lost City of Gold comes out August 2, with or without Swiper. Come on, vámanos! Everybody let’s go!